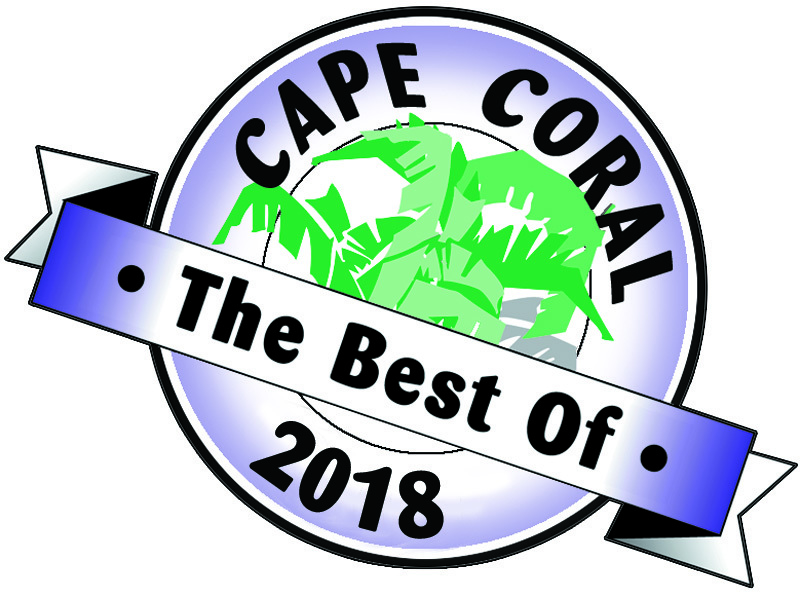 We offers a complete line of vertical alternatives such as ADOwrap, ADOglide (Panel Tracks) & Slide Vue verticals that make an excellent addition to any décor and we are certain to find the look that is right for you! Are you seeking a window or door treatment that’s versatile, functional AND beautiful? With ADOwrap®, you can have both elegance and privacy with a tailored look found only on your professionally designed windows. The ADOwrap® features vanes of vertical blinds which are “slipcovered” with continuous ADO seamless fabric using ADO’s drapery snap tape. Vertical blind hardware is used to tilt, open and close the ADOwrap® Complete. Maintenance is a breeze with ADOwrap®. Just unsnap it, machine-wash it, reattach it to the vanes, and you’re back in style. And like all ADO draperies, ADOwrap® is guaranteed colorfast, washable and dimensionally stable for five years. 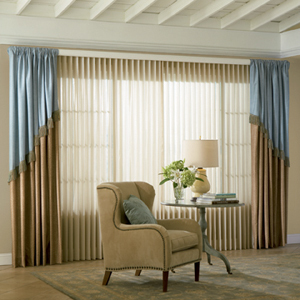 Do you seek ways to modernize your room’s window spaces with clean lines and privacy borders? With ADOglide, you can mix and match fabrics to create distinct color-coordinated panel systems for windows or as space dividers. Fabric panels can provide you modern looking options for covering windows or doors, or allow you to stylishly divide a large room into sections. ADOglide is characterized by its easy back and forth movement, and uses a left, right or center split draw baton or cord for opening and closing. The fabrics can be changed out quickly or washed and rehung with the use of Velcro® attachments – and the weighted bar at the bottom of the treatment gives it a straight, perfect hanging appearance. With the ADOglide treatment, you can showcase up to ten fabric panels on the headrail carrier, which means there’s a lot of room for added design and fabric coordination on large windows and doors. 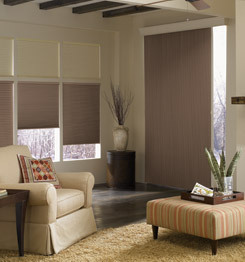 Enhance wide windows or patio doors with Slide-Vue vertical Cellular Shades. Available with Cream, White Satin or Milk Chocolate rails to accommodate any décor. 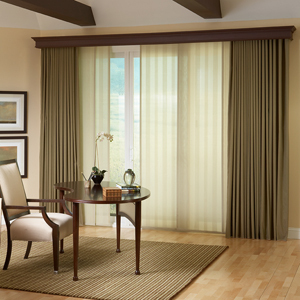 • Sheer fabrics allow the most light into the room, providing a great view to the outside & minimal privacy. • Light-filtering fabrics block some light while providing minimal privacy. • Room-darkening fabrics significantly dim light and offer increased privacy. • Blackout fabrics provide maximum privacy & block all light, perfect for bedrooms, bathroom & nurseries.